Many firms use proprietary project management tools to manage internal project but when the projects are done between various companies, usually they come back to Excel in order to communicate properly between each other. Even the big car manufacturers like GM, Mitsubishi, Toyota tend to use Excel Gantt Chart Templates to make their project management plan. There are important tool to do project management like Gantt Chart and Open Topic Lists. You can find both on this site. The nice part of doing project management with Excel is that Excel is a very flexible tool. You can start very rapidly and then modify bit by bit, you can add colors very easily, you can share it with many people because everybody has Microsoft Office. If you have a project management tool that is dedicated to project management then you will have a steep learning curve. With Excel, this learning curve is much more soft so using ExcelMadeEasy templates for project management will help you a lot to start smoothly in project management with Excel. We have developed a Excel Gantt Chart template that allows you to track all the project you are working on without having to investing in expensive project management tools. The advantage is its flexibility and also that your suppliers, customers and colleagues can read it with Excel very easily. The Project Gant Chart template with here an example with a family house building. In the free version, you can only enter the start days, duration and percentage completion. This is largely enough to manage any small to medium project. Use the pro version if you want to manage larger projects. WBS which means Work Breakdown Structure of your Gantt Chart represents the ranking of the different sub-tasks or child tasks that allow to do the parent task. The WBS of the Gantt Chart are created automatically with a complex formula created by Jon Wittwer owner of Vertex42 and who has given us the permission to use it as well as some other design elements of the spreadsheet. Thanks Jon! Task Name is the name you give to the task. Every Gantt Chart must have clearly defined task name, if possible unique. Important here is to be clear and speak in a simple language. Also try to keep short name but do not use acronyms except if they are fully understood by the users. Responsible is the person in charge of the task. He is the DOer or Manager of the task. See our RASIC chart to define the responsibilities clearly. Start Day is of course the date the task is starting. Be realistic. If the task follow each other then only enter the date of the first subtask and its duration. Automatically the next tasks will be calculated. End Date is when the task are supposed to finish. This is a calculated value. Duration is the number of days the task will last. Be realistic here too. We are dealing with people not machine. So take into account the human nature. These are calendar days so add the number of weekends to this number. As this is for small projects (personal usually) the number of calendar days is better. If you want to enter working days in the Gantt Chart Template, then you could try our PRO version. %Complete indicate the progress of your project. This progress will appear in the horizontal bars on the right of the Gantt Chart Template. Working Days are the the number of working days (not including the Saturdays and Sundays) left for the task. Days Complete relates to the percentage complete. Days Remaining are the number of days left to complete the task. Here you can see if your are on time or not and adjust accordingly. The next screenshot shows you that you can change the Gantt Chart scale. 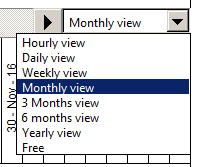 You can change it to Hourly view, Daily, Weekly, Monthly, 3 Months, 6 Month and Yearly. You have also the possibility to enter a free range. Here another view of the home project. You can also enter the holidays and select the weekend you wish. Here in daily view. See how the scale on the Right of the Gantt Chart is day after days. SubTask dependency like in the house foundation task hereunder where the task 2.1 is dependent of the 2.1.1 to 2.1.3. You can download the free version here. Please let us know if you enjoyed it. The Free OpenOffice version can be downloaded here. 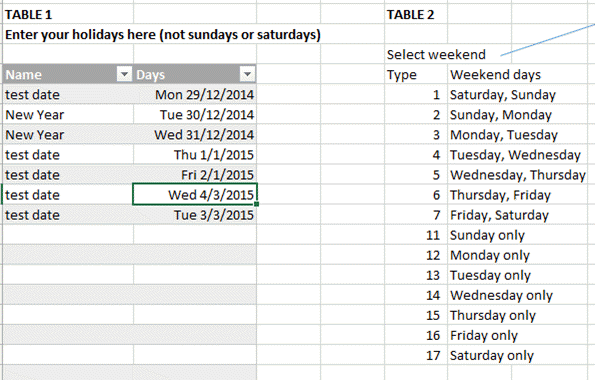 It is limited to enter dates in calendar days, no color tabs, no holidays or weekend selection. Here the features of the Pro Version Gantt Chart Excel Template. Another important tool in Project Management is the task following. With a Gantt Chart, it is not that easy to follow the tasks in details. Usually you have regular meetings with your team and you all discuss the project in details. Everyone who has a task, usually updates the team. In order to keep records of this, you need a good tool. The Open Topic List is the perfect tool for this. 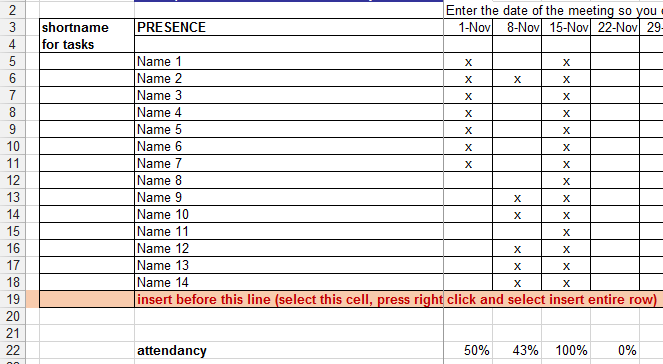 It also includes a meeting attendance sheet. With it, you are sure to see who is attending, who is not. This table is being constantly updated and improved. Keep following us on the main Open Topic List Page. You can download an OPEN OFFICE version under this link.